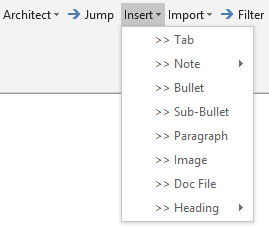 We’ve added a new Insert menu to more logically organize SDA’s functions that insert content into quote files. Insert >> Tab replaces Get tab(s), and the Insert note and Insert Dynamic Content menu items are moved from the Update tab(s) menu to the new Insert menu. Other than Tab and Note, the other content elements (bullets, sub-bullets, paragraphs, images, doc files and headings) must be inserted within a Dynamic Content “block” that is set up by your administrator. For more information on dynamic content, please refer to the discussion of the “Dynamic Content Creator” within our help documentation. Insert >> Doc File has been added to the Dynamic Content Creator functionality. In addition, if your company has taken advantage of SDA’s SharePoint integration, for both Insert >> Doc File and Insert >> Image, users will be prompted to either browse for the file via local/network folder or SharePoint (requires the SharePoint integration and SDA cloud services version 1.6.1.1 or later). The Price Book functionality has been updated to make it easier to perform multiple searches within the same Price Book “session”. To add price book items to the quote file, simply double-click the item. To see the full part number or description for an item (if either or both are too long for the grid), single-click on an item. The line-item goal seek function has been updated to allow users to apply line-item goal seek to SERVICE items. This function enables users to LOCK the cost of items so that they’re not over-written when an ‘update tab’ function is performed, which can reset the cost back to what’s in the SDA database. This function is normally only needed for items inserted into the quote file from the Price Book for which the cost is manually modified by the user (e.g., for special pricing from a manufacturer). This function is NOT needed for items imported into a quote file if the “Get pricing from import file (not database)” checkbox was checked when the import function was performed. The Product Cat defines how items are grouped on a schedule of equipment and services, which in turn drives the order that product-related content appears in proposal outputs. So, it’s important to properly set the Product Cat for each item. We’ve made that easier by positioning the cursor at the top of the Product Cat column for imported items. You can easily redefine Product Cats for multiple items at the same time by holding the Control key while clicking on multiple rows (one cell per row is good enough) and then selecting Update tab(s) >> Update Product Category for selected rows. 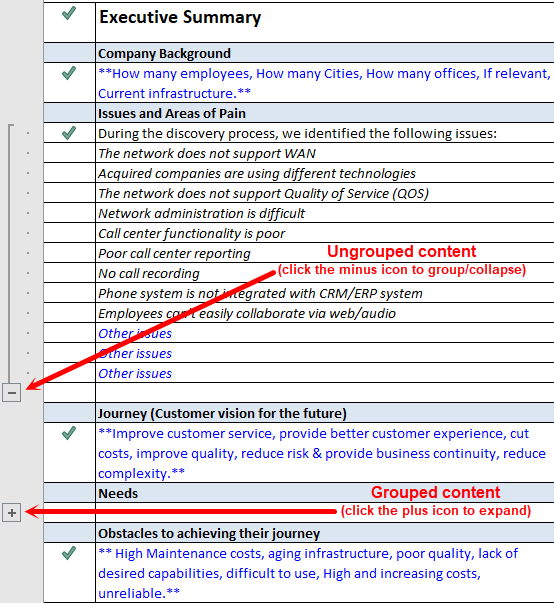 You can now use Excel’s data grouping feature to create expandable/collapsible content sections within SDA tabs for a “cleaner” user interface. Please refer to our help documentation for further information.